Here’s what we can offer to architects, builders / general contractors / developers, carpentries / carpenters, real estate investors and public administrations. It is our main activity that includes all the aspects related to the construction of a wooden structure starting from the static calculation, the building physics evaluations up to the complete engineering. Over the years we have created and improved the procedures (down to the smallest details) in order to optimize costs and reduce production times. We have succeeded thanks to an intensive research and development work in collaboration with some Italian universities (La Sapienza di Roma, University of Trento and Bologna) which lasted over 10 years. Our commitment on this front continues and we guarantee our customers the most suitable and most advanced solutions to their specific problems. The transformation process of the architectural project starts with an in-depth structural analysis to study the static and dynamic behavior of the building. Then we create a 3D drawing of all the wooden elements, and finally we program the automatic CNC cutting machines. What if the materials used are mixed? No problem, we also deal with the design of steel and reinforced concrete elements to create hybrid structures. All these activities are carried out internally to ensure a smooth workflow and maximum respect for budget and time. If you want to deepen the technique and the procedures we use, visit the specific page. It is a test that allows to measure the airtightness and to discover the “air leakages” of a building. 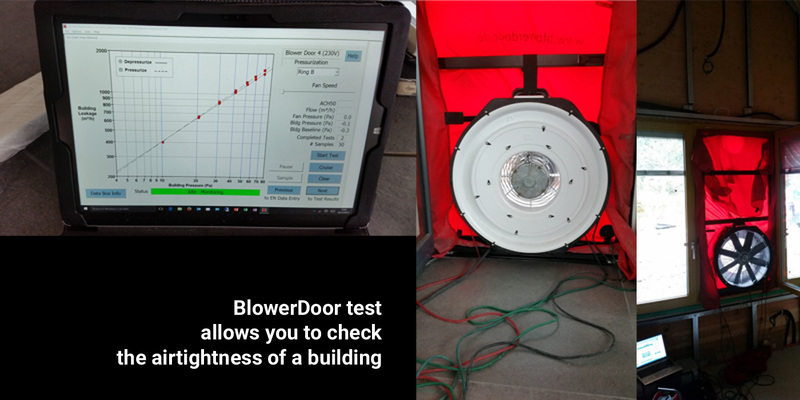 We carry out BlowerDoor tests with Minneapolis instrumentation combined with thermographic analysis and smoke generator. The test is essential to quantify the construction quality and to obtain the energy certification according to the protocols of prestigious bodies such as CasaClima and PassivHaus. Do you want to be sure to achieve high performance in terms of airtightness on both wooden and masonry buildings? Write us now! We can help you. We are always looking for excellence: of ourselves and of services and tools we use. All this is available to our customers. We offer support to the R&D departments of companies, not just for timber constructions. Thanks to an excellent software package we can offer customers a range of customized solutions designed to meet specific needs and to solve your problems! An example: we have supported and accompanied the research into the creation of a Wk4 class security door and in 2011 the project obtained the coveted “CasaClima quality door” award, the first ever in this category. On behalf of the CasaClima agency (http://www.agenziacasaclima.it) we give lectures on timber constructions, design, building physics, air tightness and measurement techniques (BlowerDoor and thermography). We are teachers of post-graduate masters organized by the University “La Sapienza” of Rome about green building and energy saving and the University of Bologna at the “Master Wood”. Last but not least, there are numerous internal training courses held at companies and participations, as speakers, at conferences on the issues of wooden constructions and energy savings all over Europe. Given the growing interest in timber constructions, many agencies have started research programs to analyze specific issues and find solutions to new problems that arise in a market in continuous and rapid evolution. Ergodomus actively collaborates with some Italian universities including “La Sapienza” in Rome, Trento and Bologna. published in 2010, it is proposed as a reference text not only for those who start designing wooden structures but also for those working in the sector and want to learn more about some specific issues. published in 2014, is the manual for the correct design and construction of wooden buildings from every points of view: static, building physics, air tightness, detailed analysis, engineering, etc … The book contains dozens of construction details and has been printed and distributed in over 5000 copies.